Looks like 'wedgewood blue' or close, which - in paint colors - is a greyish blue. The stain is "Cabot" Bluestone Semi-transparent over cedar. What color are the doors? They are beautiful. Thank you. doors and windows are Eagle Window's "Moody Blue." I LOVE these exterior colors. Will you provide brand and name of colors? - Color name for posts and ceiling? Color name for stucco? Color name for the blue trim? 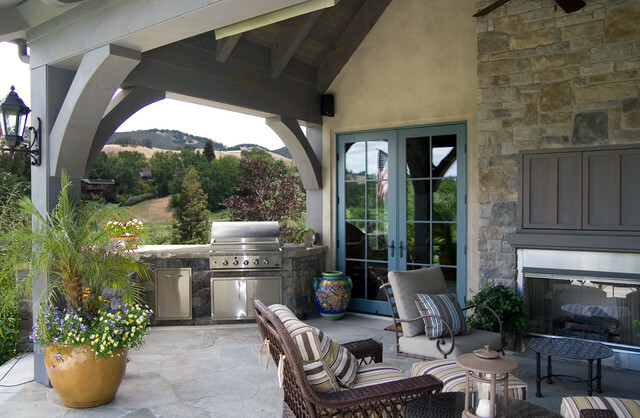 Finally, who is manufacturer for stone siding and flagstones? Thank you so much! The stucco is "LaHabra" Mirage, the stain is "Cabot" Bluestone Semi-transparent , the cast stone is "El Dorado Stone" York Limestone.